Our distributable earnings increased by 280.7% to R527.4 million (2017: R138.5 million), resulting in DEPS of 75.0 cents (2017: 19.7 cents). In June 2018, just before year-end, I was appointed as CFO when my predecessor, Melt Hamman, was confirmed as CEO after serving the dual role of CFO and interim CEO for six months. At the end of the prior financial year, we set ourselves three major goals for 2018: achieving REIT status from the JSE; meeting our maiden distribution target of 73.0 cents per share; and improving our interest cover ratio by reducing interest-bearing debt after disposing of non-core assets. In May 2018, we received approval from the JSE to operate as a REIT and, in September 2018, declared our maiden dividend of 74.0 cents per share. In addition, our interest cover ratio improved to 1.6 times, substantially better than the prior-year ratio of 1.1 times. We have therefore achieved all our major goals. As a result of regulatory REIT approval, our key performance metric has changed from growth in net asset value per share which was appropriate as a capital growth property company, to delivering sustainable, growing DEPS. Accordingly, our results focus on DEPS for the first time. DPS is now the key performance indicator for trading purposes. Our distributable earnings increased by 280.7% to R527.4 million (2017: R138.5 million), resulting in DEPS of 75.0 cents (2017: 19.7 cents). This reflects increased operating profit, reduced finance charges and a lower tax liability. We recycled capital from non-cash yielding investments to reducing interest-bearing debt and invested in our development pipeline. On the back of the achieved DEPS of 75.0 cents, the board declared a maiden distribution for the year ended 30 June 2018 of 74.0 cents per share. This exceeds the market guidance of 73.0 cents per share provided in the June 2017 and December 2017 financial results announcements. * Includes developments under construction, development rights and infrastructure andservices. The South African portfolio, which includes net operating income from our South African properties less finance charges from rand-denominated debt, contributed the largest increase in nominal terms. This was assisted by newly completed properties contributing to rental income and a reduction in interest-bearing debt in the prior year as well as further reductions in the current year, resulting in reduced finance charges. This segment contributed 61.0% of total DEPS. The Waterfall development carries the costs of development rights, being rates and taxes, which reduces our DEPS. There is no interest-bearing debt against these development rights. Our investment in MAS comprises dividends received during the year. We benefited from growth of around 30.0% in the underlying euro dividend and 13.5% due to rand weakness. This segment contributed 28.7% of total DEPS. Rest of Africa retail investments reflects the net cash interest received, net of any cash interest paid on interest-bearing debt against the investment. This segment contributed 8.0% of total DEPS. Other assets – SA reflects the cash interest received on our cash balances, less cash taxes paid. The tax liability for the period reduced to R21.9 million, down from R100.6 million in the prior year. The reduction was largely a result of the REIT conversion. We expect this to reduce further in the coming financial year. Rental income, excluding the impact of straight-lining, increased by 9.4% to R2.0 billion (2017: R1.9 billion), mainly due to newly completed buildings in the review period as well as properties completed in the previous financial year, which are now included for a full year. The five new buildings and Massbuild extension contributed R69.8 million to rental income and R58.4 million to net operating income. Property expenses decreased by 2.4% or R17.6 million to R724.7 million, mainly due to non-recurring expenses for the Mall of Africa incurred in 2017. Like for like, property expenses increased 8.6% due to newly completed buildings in 2017 and 2018. Municipal charges rose 5.8% to R448.6 million (2017: R423.9 million). The municipal charge recovery ratio increased to 92.8% (2017: 90.0%) as the Mall of Africa photovoltaic plant came into operation during the year. 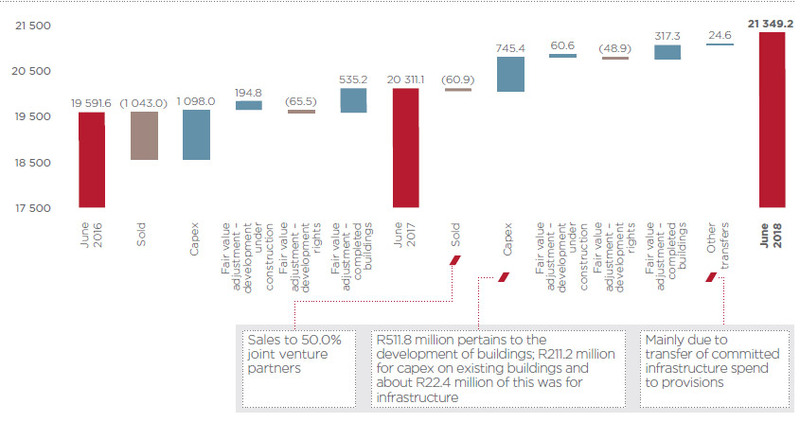 The cost-to-income ratio calculated below is based on best-practice recommendations issued by the SA REIT Association. Due to the leasehold nature of our Waterfall development rights attracting a land-lease rental expense, the ratio has been adjusted to enable comparability with other REITs. Our 50.0% investment in Newtown, consisting of shareholder loans, is consolidated. In 2018, we and our 50.0% co-shareholder each wrote down R112.4 million of our shareholder's loans to Newtown due to lower rental projections. On consolidation, this had the effect of reflecting an income related to Atterbury group's share of the write down. The significant reduction in operating and other expenses over the prior period reflects a lower impairment of our investment in AttAfrica of R25.8 million (2017: R82.8 million), the European Shopping Centre Fund Limited (Stenham) impairment of R116.6 million in the prior year as well as the lower foreign exchange rate loss of R32.4 million (2017: R162.7 million) recognised on our euro-denominated debt. The movement in our net income from associates is mainly attributable to previously held associates for our investments in Cyprus and Serbia which, after their disposal in May 2017, did not contribute to our results in 2018. Also, MAS recognised a negative fair-value adjustment on its listed REIT portfolio in 2018, reducing our equity-accounted income from this associate to R68.8 million (2017: R190.0 million). Fair-value adjustments on buildings in the South African portfolio were affected by impairments on 2 Eglin, Newtown precinct and Brooklyn Mall. The negative fair-value adjustment on Newtown precinct is due to lower rental projections while Brooklyn Mall's valuation decreased on lower expected rental income given increased competition in the area. During the period, finance charges benefited from a reduction in the average cost of debt as well as the reduction in interest-bearing debt using disposal proceeds from non-core assets. This was countered by an increase in interest-bearing debt on newly completed properties. In addition to the reduction in current taxation for the review period, the reversal of the deferred taxation liability on REIT conversion totalled R1.8 billion. This relates largely to the deferred capital gains taxation liability previously carried for immovable properties. * Includes developments under construction, development rights and infrastructure and services. Development rights were revalued down by R48.9 million, mainly due to adjustments to estimated development-period assumptions in the valuation. At year-end, about 100 000m2 of PGLA was under construction (effective PGLA of about 65 000m2), comprising seven developments. The Attacq Sanlam joint ventures relate to shareholder funding of two joint ventures, mainly on industrial development rights of over 686 000m2 of developable bulk with Sanlam as a co-shareholder. As shown below, the capitalisation for 2018 valuations were largely unchanged from the previous year. * Weighted on effective interest of the valuation. The reduction in weighted average capitalisation rates on the office and mixed-use segment reflects the inclusion of PwC Tower for the first time. Similarly, the industrial segment decreased on the back of new long-term leases for the newly completed BMW Group South Africa Regional Distribution Centre and Dis-Chem warehouse. The retail segment includes the Mall of Africa which, as a super-regional mall, has a low capitalisation rate. Investments in and loans to associates and joint ventures, as disclosed below, reduced from June 2017 (R5.1 billion) to June 2018 (R4.9 billion) and relate to movements in the MAS and AttAfrica investments as well as exiting certain assets during the period. The disposal of non-core investments, which dilute distributable earnings, was a focus during the period. In this respect, R524.0 million of capital has been recycled. This includes the Nova Eventis regional shopping centre in Leipzig, Germany, The Grove Mall of Namibia and investments in Artisan. The latter two investments performed well but had not provided a cash return due to their nature and/or the gearing level in-country and were thus sold. The 22.8% investment in MAS performed as expected during the year, assisted by its capital raises completed at a premium to net asset value and foreign exchange gains on translation on the equity accounted value at year end. Currently, we are not receiving regular cash distributions from our two investments in the Rest of Africa portfolio. The PwC Tower investment of R331.7 million (2017: R243.1 million) is a loan provided to the 25.0% co-owner of that asset. The loan carries similar terms and conditions to the debt raised by Attacq Waterfall Investment Company Proprietary Limited for the development and is serviced monthly from the property's rental income. The Atterbury group loan, with a 30 June 2017 outstanding balance of R177.2 million, was settled in January 2018. The disposal of the Nova Eventis regional shopping centre in Leipzig, Germany, held by Stenham, was implemented and most of the proceeds received in July and November 2017. Brooklyn Bridge Office Park remains a non-core asset and we are still actively seeking a potential buyer. The asset has been reclassified to investment property as a highly probable sale may not materialise in the next 12 months. Amounts for Barrow Properties, Zenprop and Sanlam reflect jointly developed properties, which will transfer to the respective joint venture partners in due course. Total interest-bearing borrowings net of cash decreased by 2.4% to R10.0 billion (June 2017: R10.2 billion). Gearing, calculated as total interest-bearing debt less cash on hand as a percentage of total assets, improved from 37.1% in June 2017 to 35.8% in June 2018. The improved gearing is the result of increased cash on hand accumulated during the period and the higher gross value of assets. During the year, we converted the majority of our debt facilities to an interest-only profile. The June 2018 cash balances will be partially used to fund the 74.0 cents per share distribution. To mitigate interest rate risk, at 30 June 2018, 95.0% (2017: 90.8%) of total committed facilities of R11.7 billion (2017: R12.0 billion) were hedged by way of fixed interest rate loans or interest rate swaps, which is higher than our minimum hedging policy. The weighted average cost of funding improved over the last year to 8.7% (2017: 9.2%) on the combination of lower JIBAR rates over the past 12 months as well as the change in the weighting of underlying loans. The interest cover ratio improved to 1.6 times (2017: 1.1 times) on the back of higher operating profit and reduced finance costs paid during the year. Ongoing improvement of the interest cover ratio is a focus for management with a medium-term target of 2.0 times. R541.8 million (2017: R2.6 billion) of our interest-bearing debt is due for repayment over the next 12 months, posing limited refinance risk. 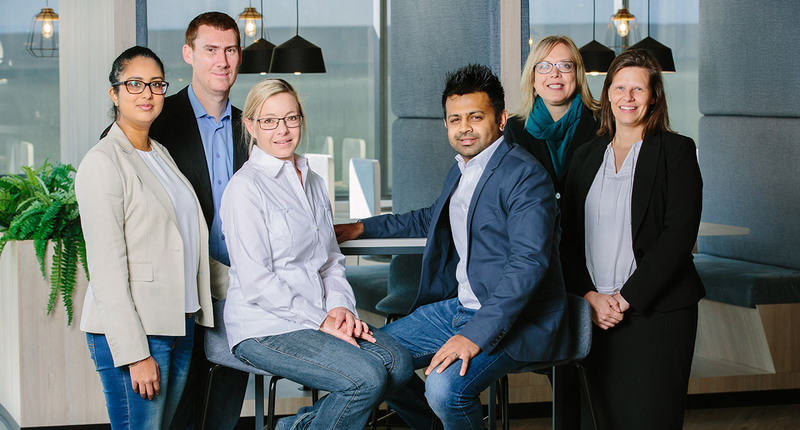 In the past year, we successfully refinanced R5.7 billion of debt, including our retail and Lynnwood Bridge portfolios, and euro-denominated debt. Despite the fact that only half the debt secured by the portfolios was due to expire in May 2018, we refinanced the entire amount early to extend the tenure of our loan book and capitalise on favourable pricing. We also used the opportunity to introduce three new institutional lenders to the group. Our key debt metrics show an improving trend in recent years, a result of our continued focus on improving the interest cover ratio and ensuring debt remains well managed. Net asset value increased by 22.7% from R13.9 billion to R17.1 billion, largely due to the derecognition of the majority of the deferred tax liability on the REIT conversion. Net asset value per share (NAVPS) growth on a like-for-like basis, excluding the impact of the deferred taxation derecognition, would have been 8.6% had we converted to a REIT by June 2017. Year on year, the total number of shares increased by 340 000 after issuing new shares for our share incentive scheme. The NAVPS is reflected below. 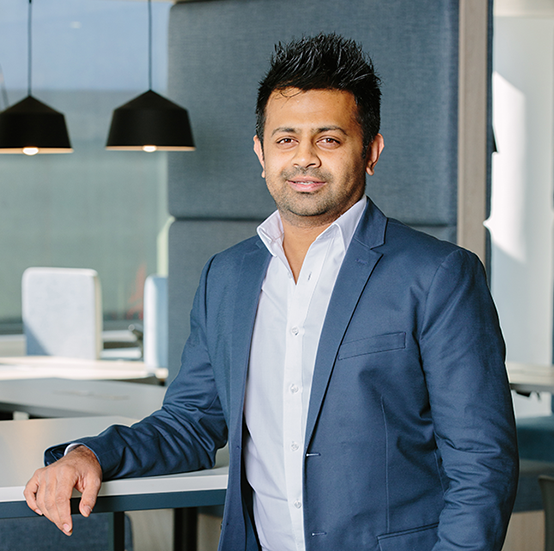 A sincere thank you to the entire Attacq team which has worked tirelessly over the past year to prepare the group to become a REIT, and to Melt Hamman, to whom I extend my appreciation for the high-performance team I have inherited.